This book presents a comprehensive account of the grammatical expression of aspect and related semantic domains in South Conchucos Quechua, a language of central Peru. Based on naturally-occurring speech, the functional-typological approach applied here integrates the description of the synchronic system in South Conchucos with an investigation of cognitive and communicative forces that have shaped aspect and related categories across the language family. Daniel J. Hintz is a linguistics researcher with SIL International. 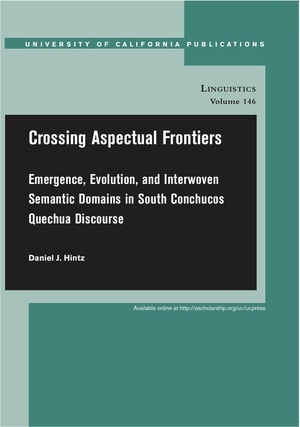 He specializes in morphology, discourse, language contact and language change, and Quechuan linguistics.